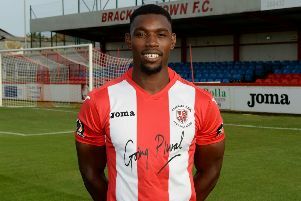 Brackley Town boss Kevin Wilkin says he will be surprised if Glenn Walker isn’t recognised for his performances of late. Walker has been in top form during October and played his part in Saints ending FA Halifax Town’s seven-match winning run in Saturday’s Vanarama National League North victory. Wilkin said: “I rarely single out individual players but Glenn Walker was outstanding again on Saturday, as he has been throughout October. “I will be surprised if Glenn doesn’t get the player-of-the-month award for this division. I’ve only ever known one other player in my time as a manager to have such an impact on games in one month as Glenn has had. And Wilkin was also full of praise for in-form striker Steve Diggin, who has rediscovered his goal-scoring touch of late. Wilkin said: “It was a great finish from Steve Diggin. He’s got eight goals now and he’s not far away from being up their with the top scorers in the division. Looking back on Saturday’s success, Wilkin added: “We changed the shape at halftime. We were competitive in the first half but did not ask enough of Halifax, we needed to get Glenn [Walker] further forward and to give their midfield more to think about.